James Crichton was born at Carrickfergus on 15 July 1879. Before emigrating to New Zealand he served with the British Cameron Highlanders, and saw active service in South Africa. He enlisted in the 1st New Zealand Expeditionary Force on 22 August 1914 and embarked for Egypt in October of that year as a Corporal in the N.Z. Army Service Corps. 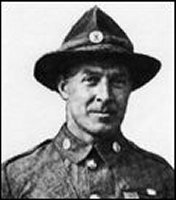 He served on Gallipoli from October to December, 1915, and left for France in April, 1916, as a Company Quartermaster Sergeant. In April, 1918, while serving as a Warrant Officer with 1st N.Z. Field Bakery, he voluntarily relinquished his rank and transferred as a Private to the Auckland Infantry Regiment. He won his Victoria Cross for conspicuous bravery and devotion to duty near Crevecoeur, France, on 30 September 1918. His citation reads as follows. Although wounded in the foot, he continued to advance with the troops, despite difficult canal and river obstacles. When his platoon was subsequently forced back by a counter-attack, he succeeded in carrying a message. This involved his swimming a river and crossing an area swept by machine-gun fire before he subsequently rejoined his platoon. Later, he undertook on his own initiative to save a bridge which had been mined, and although under close fire of machine guns and snipers, he succeeded in removing the charges, returning with the fuses and detonators. Though suffering from a painful wound, he displayed the highest degree of valour and devotion to duty. (London Gazette, 12 November 1918). Crichton returned to New Zealand in June 1919 and was discharged in September of that year. In 1937 he attended the Coronation of King George VI as a Sergeant in the N.Z. Coronation Contingent. He died in Auckland on 27 September 1961 and is buried in the Soldiers' Cemetery at Waikumete, Auckland.